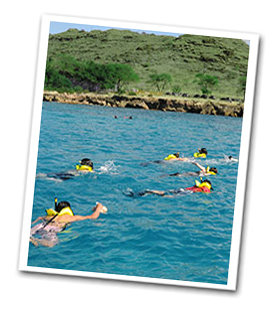 Journey to a dolphin paradise along the Wai'anae Coast for a Hawaiian eco-tour for all ages! Add on BBQ Lunch & Snorkeling for the perfect day! Watch the dolphins frolic as you enjoy premium hamburgers that are freshly barbecued onboard. 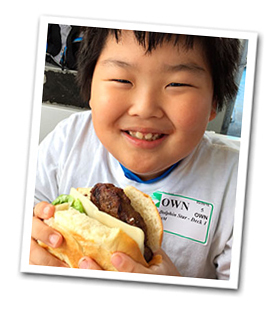 Build your own burger with your choice of gourmet fixings, plus snack on our homemade chocolate brownies. Soak up the sun or relax in our shaded cabin as the picturesque Wai‘anae coast provides the perfect island setting. Add snorkeling to your experience! This afternoon cruise combines a dolphin tour and lunch with snorkeling at our secret reef spot. All snorkeling equipment and instruction are provided. Swim with Hawaiian reef fish, explore coral beds and if you're lucky, spot a sea turtle or two! After your snorkel, enjoy a fresh water shower then sip our signature “Blue Dolphin” cocktail, and taste fresh pineapple and other refreshments. 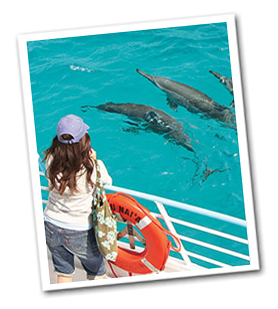 Dolphin Star® Pledge: We comply with all government guidelines for protection of marine mammals since our debut of Wild Dolphin Watch® cruise in 2007. All cruises closed on New Year’s Day (1/1), Thanksgiving Day (11/23/17), Honolulu Marathon (12/10/17) and Christmas Day (12/25). Snorkel cruise closed Father’s Day (6/18/17). Vessel: Eco-friendly, 149-passenger, 2-deck Dolphin Star catamaran was custom built for wild dolphin watching and snorkeling in paradise! The 65’ vessel minimizes emissions with EPA compliant main engines, hybrid power generator, GPS, autopilot, radar and operates at the cruising speed shown by recent NOAA studies to be safe for marine mammals. It also has a 360° observation deck, wrap-around deck, dining area, bar, restrooms and BBQ facility. Facilities: Observation area on 2nd deck. Each floor has wrap-around decks and equipped with sound system. Bar on 2nd deck; restrooms, BBQ and buffet setup on 1st deck. Newly built in 2007. Location / Check-In: Departs from Wai'anae Boat Harbor, 85-491 Farrington Hwy Wai'anae, HI 96792. For those arriving via own transportation, please check in 15 minutes prior to departure at the Dolphin Star. Transportation: Add transportation to your cruise. Round-trip motorcoach transportation via deluxe Royal Star features a comfortable ride, onboard restroom, video presentation. $22.00 per person from the Waikiki area, $14.00 per person from Ko Olina. 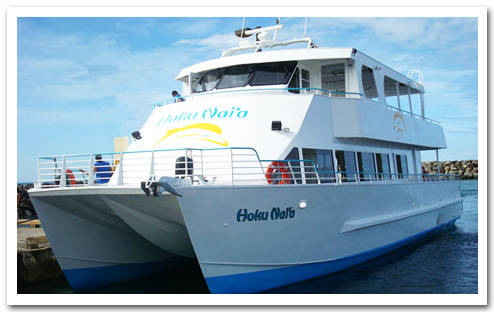 Tour from Waikiki is 5½ hours (7:35AM – 1:00PM); tour from Ko Olina is 3½ hours (8:45AM – 12:15PM). Wear casual clothes and comfortable shoes, and don't forget your camera! Sunscreen, cover-up, polarized sunglasses and binoculars recommended. Outside food and drink are not permitted onboard. We'll cruise from Wai'anae Boat Harbor toward Ka'ena Point or KoOlina, depending on the best possible route for wild dolphin watching and the best location for snorkeling. The Captain reserves the right to alter the route depending on sea conditions. How many dolphins will we see? 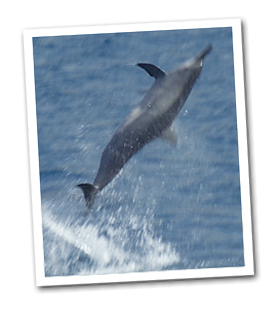 We typically see a few pods of dolphins (50-70) daily, with a 98% record of sightings. In the case of no sightings however, you will receive a "Dolphin Check" to cruise again (meal, transportation and snorkel optional). During the winter months of December through April, there's also opportunities to see whales! Yes, you can take home a souvenir photo in a paper logo jacket for $20.00. Is there something special for repeat visitors? Each guests receive a "VIP card" good for free gift when returning for a future cruise. I'd like to take great dolphin photos! Any tips? If you have a digital camera with a finder, turn off your LCD and take pictures looking through the finder. This will allow the camera to respond to your fingers faster. Dolphins sometimes jump multiple times, so keep aiming in the direction a dolphin has jumped. Use the sequence photo shoot mode if your camera has one. It is very hard to predict when the dolphins will surface, so by using this mode there is more chance of you getting a great picture! It's an interactive, educational and fun "class' with one of our certified Naturalist crew and includes souvenir learning material! Why are you located in Wai'anae instead of Waikiki? Our beautiful Wai’anae site was chosen as the best location for our cruises. Historically, the West coast of O’ahu is where the best dolphin sightings are located. Also, its distance from the city keeps it a secluded and unspoiled snorkeling spot. Wear a swimsuit and bring a towel and sunscreen. A light sweater or jacket and sunglasses recommended. You can also bring your own snorkel gear (i.e. prescription goggles) if you prefer. 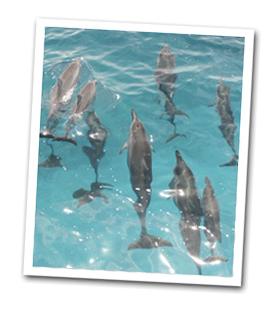 What does Dolphin Star provide for snorkeling? Snorkeling equipment (sanitized gear including mask and fins) with instruction by our crew. Vessel facilities include fresh water shower, easy step stairs into the water and onboard restrooms. A signed waiver form is required for snorkeling.